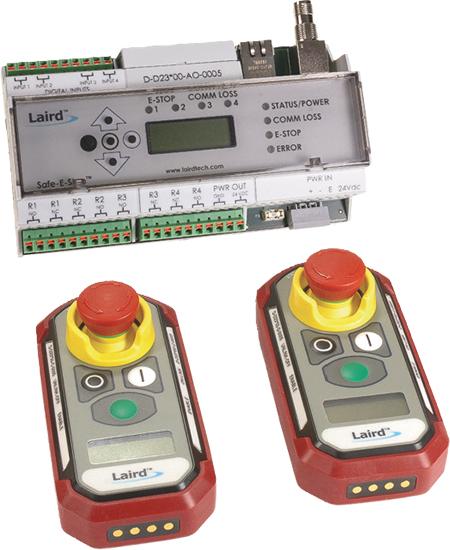 Laird debuted its Safe-E-Stop wireless e-stop system for shutting down production lines. The offering can be integrated into existing hard-wired e-stop systems to save precious seconds and avert worker injuries and fatailities, as well as equipment damage. Nearly 5000 workers were fatally injured in industrial accidents in 2015, according to the Occupational Safety Health Administration, a statistic that stresses the need for safety improvements. Continuous status indicators with LED and LCD displays. Ethernet/IP port on the machine safety device (MSD) that can be used to fully report the status of actuated wireless e-stops to operations personnel. As many as five personal safety devices (PSDs) that can be simultaneously linked to the MSD, permitting multiple operators to work independently or collaboratively to oversee an operation or solve a problem. Ability via the MSD to command a stop if an e-stop on any of the linked PSDs is activated, at which time all PSDs are notified of the stop condition, the machine is shutdown, and the system identifies the PSD responsible for the stop. PSDs with visual and haptic (vibration) warning systems for conditions such as low battery and low RF signal designed to allow workers to move about the area (within a 100-m line-of-sight range of the MSD). Safety Integrity Level 3 protection. Support of frequency bands 450, 915 and 433 MHz. PSDs with rechargeable Li-ion batteries having 12-hr. operating life and two-hr. rapid charge.